Following the zombie massacre, we are now only a handful to resist: our old lives were shattered and we had to overcome our differences in order to regroup. Zombies all look alike, but no two heroes are alike. That's what will allow us to win. Will you join us? And if you add a pirate captain, a fallen nobleman, a cynical thief, a proud Dwarf warrior and a battle priest to your team? 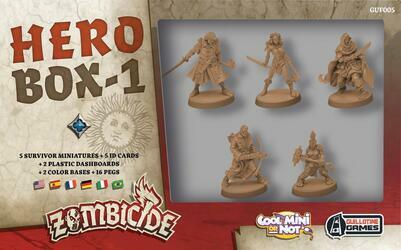 the Hero Box contains five additional Survivors for Zombicide: Black Plague, as well as all the necessary equipment to add two players to your group.